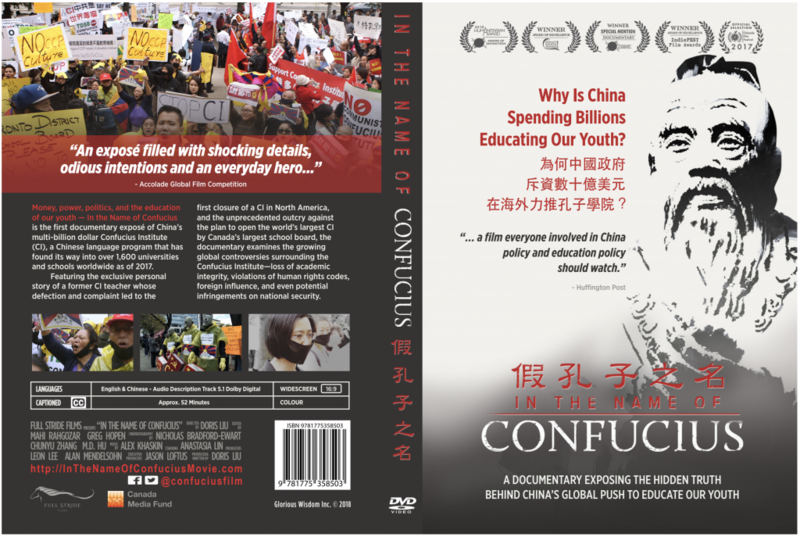 Award-winning documentary In the Name of Confucius had two back-to-back screenings in New Zealand in July 2018. Reactions from the local universities were polarized with two schools welcoming the film and one cancelling its showing. And some of the behind-the-scenes stories made one wonder if the cancellation was connected to the Chinese government. Screening at a CI host university – first time! 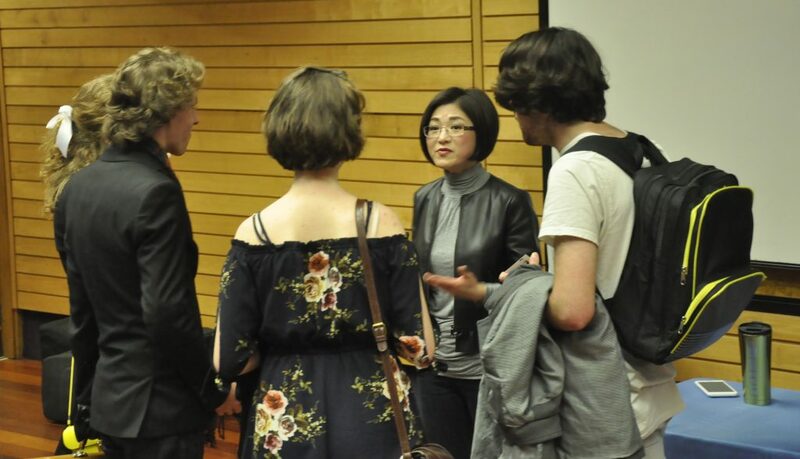 On July 25, for the first time, In the Name of Confucius was screened on a campus where there is a Confucius Institute (CI)–Victoria University of Wellington. Nearly 200 people showed up at the screening, including the CI director! 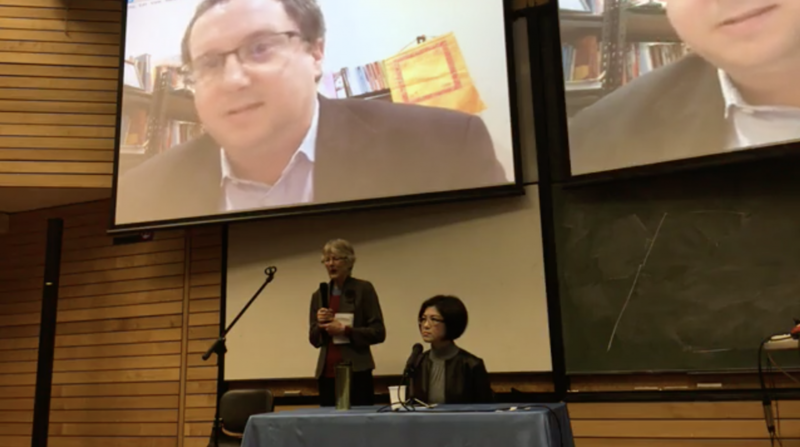 Dr. Kevin Carrico, lecturer of Chinese Studies at Macquarie University, joined film director, Doris Liu via Skype from Sydney, Australia for a 70 minute panel discussion after the screening. 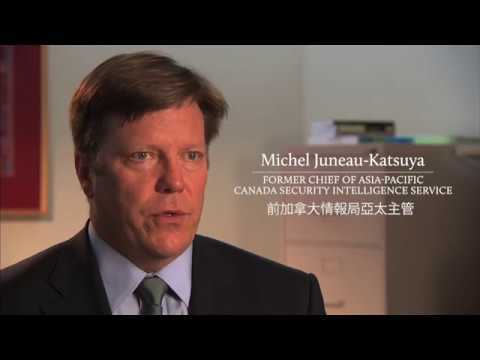 They addressed the threats posed by CIs, the Chinese government’s influence and possible infiltration in New Zealand, and suggested how these could be dealt with. The CI director shared some of her positive experiences working with the Confucius Institute and listened to most of the discussion. 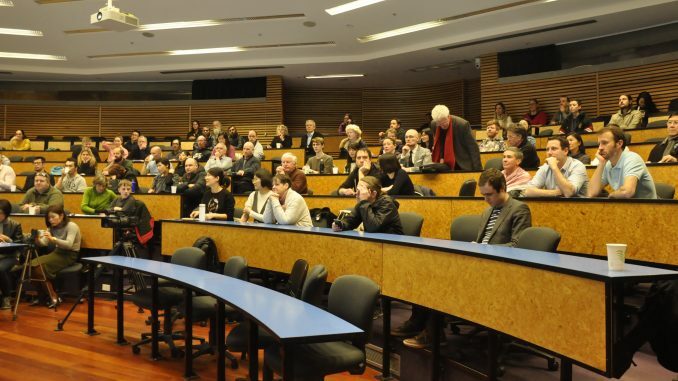 On July 26, the second screening at the Auckland University of Technology (AUT), which doesn’t host a Confucius Institute, saw an over-capacity turnout. Some people sat on the floor to watch the film and listen to the discussion. Director Doris was joined by Thuten Kasang, National Chairperson of Friends of Tibet, at the panel. Local pro-Chinese democracy activists also attended, bringing their messages shown in the left. They thanked Doris for making this film. In spite of the two university screenings, another CI host school, University of Auckland (UOA), first downgraded a scheduled screening to an internal screening for staff and students before cancelling it completely. The organizers were told that the screening was “prematurely advertised as being open to the public” before it was approved by the faculty. In an email that we obtained, the UOA vice chancellor said that the cancellation was due to lack of numbers. 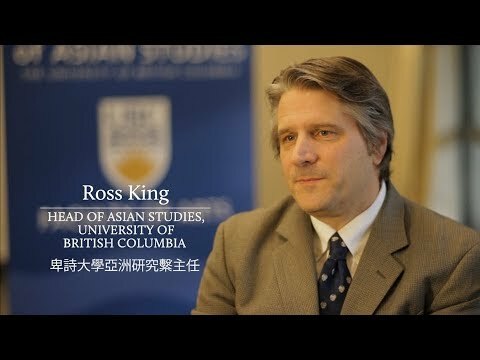 According to this article published on Asia Pacific Report, local Chinese consulate official contacted Auckland University of Technology prior to the screening on the campus. 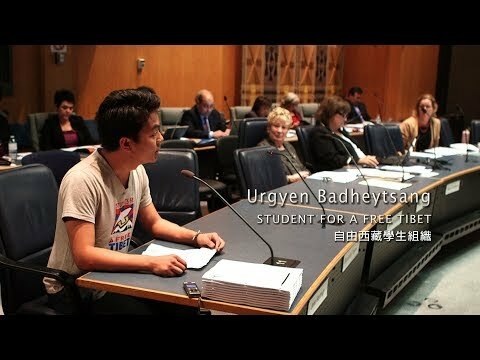 The article didn’t disclose what the Chinese official had told the AUT about the film screening. Last time a Chinese government official contacted a venue provider of the film screening was in November 2017. 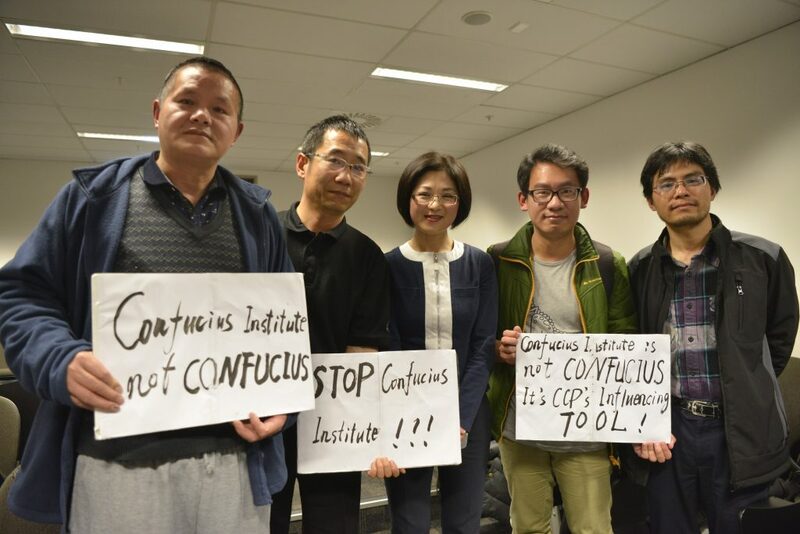 The Chinese embassy in Tokyo, Japan had tried to stop a screening of In the Name of Confucius by pressuring the Japanese government to cancel an international human rights conference, saying that screening of the film would damage the Sino-Japan friendship. There are 3 Confucius Institutes and 30 Confucius Classrooms in New Zealand.